As a foodie-culturalista, I am keen to find out what the Dayaks and their much feared forebears, the headhunters ate. 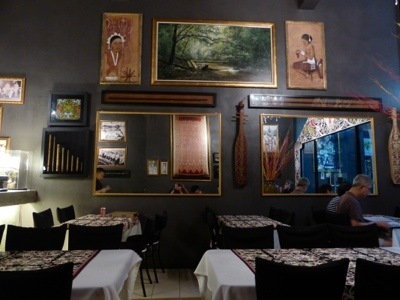 Although the indigenous tribe in Borneo collectively known as ‘Dayak’ comprises 40% of the population in Sarawak, it is perplexing to discover that there is only 1 fine dining restaurant in Kuching serving authentic Dayak cuisine – the.Dyak which opened in late 2011. 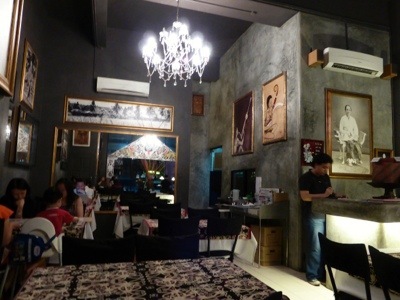 The restaurant is an attention-grabbing corner shop in a shophouse, with 2 big red pillars decorated in Dayak florid motifs. 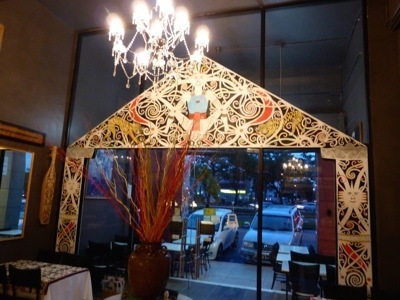 One enters the restaurant through the elaborately decorated gable entry into an Aladdin cave of Dayak treasures. Every single inch of the wall is adorned – mirrors, beadworks, weavings, family portraitures, blowpipes, sapes, just to name the few – totally making a cultural anthropologist swoon. One can truly chillax chief-of-the-longhouse-style in the air-conditioned comfort, perhaps even updating one’s Facebook status or write a review on TripAdvisor (which is a popular mode of advertising for the competitive restaurant market in Kuching) with the free wifi provided. Navigating a Dayak menu of unfamiliar food is a breeze with a pictorial menu with English descriptions and an attentive waiter on standby to explain the intrinsics of the dishes. There are many items in the menu ranging from grilled, roasted and fermented meats; fermented durians, jungle shoots and vegetables, many of which I have never tried. I was disappointed to find that sago worms, puffer fish and raw fish which were the dishes I had especially came for needed 2 weeks advance notice. Despite that, there are other interesting indigenous Dayak cuisine that impressed me. First to arrive at our table was the Tilapia Terung Dayak (RM35). 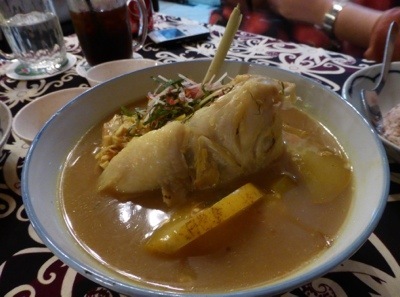 A giant fish head thrusting out from the platoon of aromatic lemongrass, fried garlic and shallots in a thick piquant yellow turmeric soup. The star here is the unassuming ‘terung dayak‘ or sour eggplant , an indigenous fruit to Borneo resembling tomato, socking a KO mouth-puckering sour punch to the soup. I am very drawn to the toughness of the terung dayak which did not disintergrate in the cooking process, thus giving me enjoyment in every bite. The fish on the other hand was so-so with lots of small bones, so best eat with caution. My dining companion who has strong aversions to fishiness told me that this is a farmed fish because she detected ‘muddiness’ in the fish. Little wonder, since fresh river fish is hard to come by due to water pollution and over-fishing of the past. With the plethora of salty-tangy-aromatics, rescue came in the form of red unhusked rice (RM3 per person). Perfect for soaking up the gravies and soups to placate my over-worked taste buds. 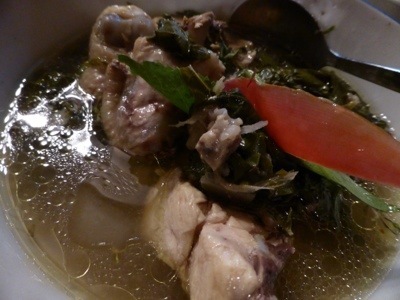 The dish that I was looking forward to was Manok Lulun (RM23), also commonly known as Ayam Pansoh. This is traditional Dayak cuisine of chicken cooked in bamboo with ginger, onions, lemongrass, ginger flowers and tapioca leaves. 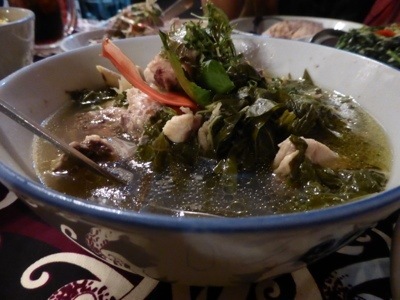 However, the zingy soup is a tad too salty and I could not detect any bamboo fragrance at all, perhaps it was overpowered by the use of lemongrass. In the hunter-gatherer nomadic tribes around the world, fresh meats are scarce and usually preserved for important events and festivals. With fermented foods all the rage at the moment, I am eager to test out indigenously cured meat dishes. 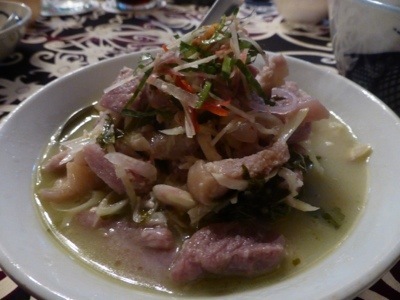 Jani Kasam (RM25) is fermented pork with fat and skin intact (3 -layered meat), sautéed with tapioca leaves and garlic. This is my favourite dish, unfortunately not for the uninitiated. It has the pungent smell of stinky beancurd, very salty and very sour – but for me – totally appetising! This is the first time that I have eaten the slippery and mushy tapioca leaves. It has a very interesting soft textures which I enjoyed. 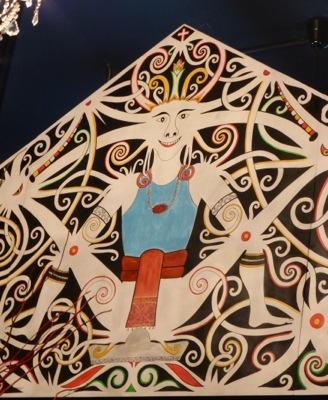 Apparently, tapioca or cassava leaves were part of the Dayak’s staple diet. They have a lot of beneficial minerals and were foraged plants that grew in the wild. Nowadays, they are cultivated at almost all the longhouses. 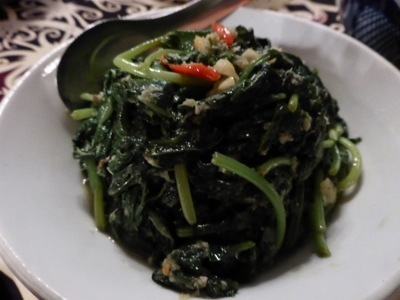 Another beneficial plant that I have never tried is the Daun Ubi Randau Guring (RM12) or Sweet Potato Leaves. This is a delicious sautéed vegetables with garlic and desiccated coconut, the original version has dried shrimps which I have asked to be omitted due to my allergy. According to a new report from the University of Arkansas, sweet potato leaves has the world’s richest source of disease-fighting antioxidants and poised to become the next big health-food craze – Glad I’ve tasted it now! 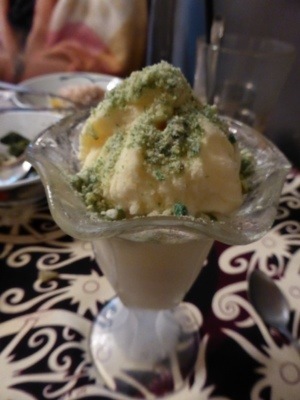 The finale to our meal is the much lauded Tuak ice-cream (Rm6.50). Tuak is fermented rice wine akin to Chinese rice wine. The alcohol content ranges from low 10% up to 50%. This is an easy to assemble dessert at home (provided one knows how to make tuak), a scoop of vanilla ice-cream on top of fermented rice or jiuniang, which happens to be my favourite dessert (my review of the jiuniang in Hong Kong here ), doused with tuak and finished with crunchy pralines toppings. A decadently refreshing dessert. My general verdict of traditional Dayak cuisine is that it is healthy food consisting of previously foraged (now cultivated) and fermented foods. I am sure that the.Dyak had modernised the menu to suit modern tastebuds, thus the afinity to Thai cuisine in the use of aromatics such as lemongrass, shallots and garlic. Taste-wise, I find the overall taste of the dishes to be quite similar and a bit salty. Food is on the expensive side, with a glass of warm water costing RM1. While googling info on Dayak cuisine, I found this write-up on capitalising on Sarawak cultural food (here), the.Dyak’s proprietor is one of the restauranteur interviewed. Let’s hope for new Dayak restaurants openings! This entry was posted in Fine Dining, Indigenous Cuisine, Kuching, Malaysia and tagged Ayam Pansoh, Cassava Leaves, Cured Pork, Dayak Cuisine, Fermented Pork, Indigenous Foods, Indigenous Paleo Diet, Paleo Foods, Sweet Potato Leaves, Tapioca Leaves, Terung Dayak, Tilapia, Tuak. Bookmark the permalink. Vegan diet is not meant for everybody. People have different nutrient requirements. While a person thrives on going raw or vegan (or atkins) in the beginning of the diet, after maybe 5 or 6 years, certain nutrients in the body depletes, then their health deteriorates. The early inhabitants on earth had no idea on what is healthy nor the meaning of ‘diet’ in that matter, they simply ate on what they could find. They ate to survive. They did not over-eat nor dwell on 1 group of food. I was on raw vegetarian diet for a while, but it did not work out for me. I find that I still needed cooked foods and meats to function. Perhaps if I was put on a vegan diet when I was a toddler, my body would have adapted to it. But for now, I’m still experimenting on different diets. Thanks for the info! 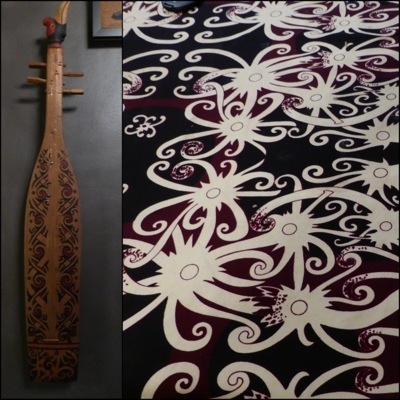 Daun Ubi Randau Guring – I have to copy it too! 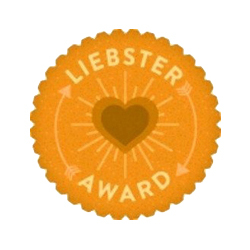 – is sweet potato leaves. It is often discarded because people only go for the potatoes. Yes, the dessert is yummy – you can buy jiuninang at the refrigerated section at the Chinese grocery. 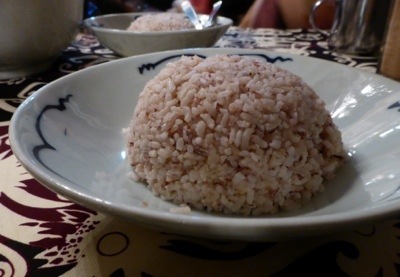 Eat it with ice-cream or the glutinous rice balls! That restaurant is so lovely! I must confess I never heard of Dayak cuisine before. Looks very good, I wish I can get to try it someday. Yes, it’s very quirky. I like the artwork there. The Dayaks are the original inhabitants in Borneo, like the aborigines in Australia, but they are not related. If you like nature and jungle trekking, then you should visit Borneo, otherwise, there is nothing much to do here. The food is not warm enough. the soup are all pre cooked. Once you pre cooked the gravy and all, the taste somehow is different. As it is, when you eat in a restaurant, you expect them to be piping hot from the kitchen. The only thing I like there is the Tuak / rice wine ice cream. Will go again just for the ice cream. Cheers! I was here too! Food’s so-so, not bad but I got put off by the fact that they charge for any request for an extra empty plate…and they out up a sign to ask diners for tips. Tsk! Tsk!